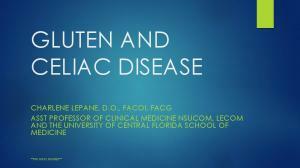 Magnitude of the Problem of Celiac Disease Celiac disease is an autoimmune disease affecting the small intestine. Various studies have shown its association with other autoimmune endocrinologic disorders affecting different organs -systemsof the body such as diabetes, thyroid disorders and infertility. In fact 50% of patients affected with celiac disease have atypical presentations not involving the GIT and consequently, many celiacs are expected to seeks medical advice from specialists other than gastroenterologists. We, as Ob/Gyns, should be aware of the different presentations of the disease that we may encounter at the office. Definition • Celiac disease is a life long autoimmune enteropathy affecting small intestine characterized by a permanent intolerance to dietary gluten. Gluten is a protein found in the cereal grains of wheat, rye, barley & oats. • In affected individuals, ingested gluten causes inflammation and damage to the small bowel. This damage impairs the normal absorption of food leading to nutritional deficiencies and therefore, can affect the body in many different ways. Incidence The incidence of Celiac disease varies between 1-100 to 1-300 in the general population according to geographical distribution. Generally speaking, celiac disease is more common in women than men. This high incidence can be explained by the fact that women are more keen about their health compared to males and therefore, they seek early medical advise. The high incidence of the disease in women can be just a simple reflection of this behavior. Incidence (Cont.) The incidence of celiac disease varies among specific groups. It ranges between 4-8% among women diagnosed with unexplained infertility. About 6% of anemic women have undiagnosed celiac disease. A recent study suggested that 3-4% of women who have osteoporosis have celiac disease. Effect on Bone Mineral Density • Celiac disease decreases bone mineral density in affected women. The underlying mechanism is related to calcium malabsorption and subsequent increase in parathormone secretion by the parathyroid which, in turn, increases bone turnover. • Treatment with vitamin D may be required in the presence of osteomalacia. Diagnosis (Cont.) III-The gold standard diagnostic test is endoscopic biopsy of the upper small bowel. Because of the invasive nature of this, it should be reserved only for those with positive screening serology tests. However, A negative test may still prompt a biopsy if the clinical suspicion is high. 4-8 biopsies should be obtained for diagnosis from either the distal duodenum or the proximal jejunum. Diagnosis (Cont.) IV-Prothrombin time and partial thromboplastin time: useful to identify deficiency of vitamin K, which predisposes patients to hemorrhage V-Radiology: has no role in the diagnosis of celiac disease. However, it can help rule out other pathologies of gastro-intestinal disease. Treatment (Cont.) 2) Avoid medications and vitamin preparations which contain gluten. 3) Steroids or immunosuppressants in refractory cases 4) Supplemental iron, folate, B12, calcium and magnesium. 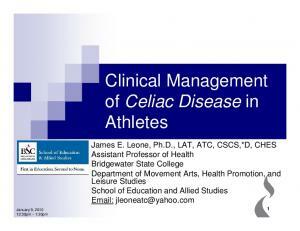 Report "Celiac Disease in Women"